So the curtain has come down on 2014, and while Irish rugby is coming off a fantastic year, and is most certainly on the up as a whole under the stewardship of our man Joe, it is fair to say that there is a large sense of dissatisfaction permeating throughout the provinces of Ulster, Munster and Leinster. The new dawn of the Heineken European Rugby Champions Cup has been a resounding disaster for Ulster and Munster especially, and barring more January miracles à la Gloucester in 2003, and a large slice of lady luck, both squads will be left to rue costly defeats at home against French opposition. While Leinster remains in the hunt, there has been growing sense of disenchantment at the type of rugby which has been on show in the environs of Dublin 4 this year. For a squad packed with international players, they have looked bereft of ideas with the ball in hand and seem to just be going through the motions from game to game. High standards are expected by their supporters, who have grown used to success under first Michael Cheika and subsequently under Joe Schmidt. So far, on the surface, it appears the Matt O’Connor has failed to live up to these standards. All the blame cannot be levelled on his shoulders, but the “bedding-in” process is long past and there have been little signs of progress under his tenure. They have been resoundingly beaten in both games against a Munster side whose “return to traditional values” has amounted to a heavy dose of aerial bombardment followed by countless phases of picking and going as close to the ruck as is humanly possible. They pummelled Leinster into submission in both games in and around the fringes, and the fact that Leinster didn’t learn from the first game to me speaks volumes for the coaching, or lack of, coming from the top. That brings us to Connacht, and what a year, and especially what a first half of the season it has been for the men from the West. The strides forward which they have taken under Pat Lam have been the feel-good story of the provincial season so far. The emergence of a new, young, hungry breed of Connachtaí has started to manifest itself into results on the pitch at long last, led from the front by Robbie Henshaw and the man I believe will be on the bench behind Conor Murray come the World Cup, Kieran Marmion. The age-old motto “if you’re good enough, you’re old enough” has led to Connacht, and Pat Lam, reaping the rewards for giving youth it’s day. While the likes of the aforementioned internationals Henshaw and Marmion would be key players for most teams, it is with the integration of the other young players such as Jack Carty, Darragh Leader, Denis Buckley and Eoin McKeon that Lam deserves most of his credit. By giving them an extended chance to prove that they are capable of performing and winning in the jersey, he has brought about what many in this country have been muttering was needed for years, a competitive, successful fourth province. It is not just the development of talent within the province that has been successful however, as the recruitment policy which Lam and his team have pursued has led to the capture of a number of New Zealanders. Mils Muliaina might be the headline name, but his influence at this stage in his career (he is now 34 years old) has to be felt mostly off the field. His biggest impact has to be his experience and know-how rubbing off on the young, green men who are aspiring to become international players. With the retirement of Dan Parks in 2014, the so-called brain trust needed the addition of a man with a large amount of international experience, and few fit that bill better than an All-Black with 100 caps. They say you can’t buy experience, but Lam has tried his damnedest to defy that by bringing in Muliaina, as players of his ilk quite simply do not grow on trees. This was a clever move from Lam, as although the likes of Muldoon are hardened veterans, their game time at the highest level is almost non-existent, and successful squads need players who have expected and achieved success at every stage of their careers. I can see a strong similarity between Muliaina arriving in Connacht, winning mentality in tow, and the (re)arrival of Keith Wood in Munster before they embarked on their European adventure in 2000. Woody set the goal of winning the Heineken Cup before the start of the season, something which spurred the Munster squad onwards. Muliaina will hopefully have a similar impact. It is the other recruitment though which has caught my eye the most. Both Munster and Leinster were certainly in the market for a centre and although Munster signed Andrew Smith, Pat Howard and Tyler Blyendaal and Leinster signed Ben Te’o, it was Connacht’s acquisition of Bundee Aki that I found, on paper at least, to be the most impressive. Aki, a Super Rugby winner with the Chiefs, is considered by many in New Zealand to be a “genuine talent,” who was “on the All Blacks radar” prior to his move to the West of Ireland. It was an astute signing for Connacht, as he now forms one half of what is currently the strongest midfield partnership on this island, alongside Robbie Henshaw. Having a quality player to pair with Henshaw will take some of the load and pressure off his back, and his game should blossom as a result. By making these kind of additions and by supplementing and bolstering them with the integration of the new breed of homegrown talent which the academy is producing, it should come as no surprise that progress is being made in leaps and bounds out West. Jake Heenan is most certainly a player to be watched. Rated highly in New Zealand before his departure, the former Baby Blacks (U20) captain, who is currently recovering from injury, appears to be an intriguing and interesting openside flanker. Definitely one to keep an eye on progress-wise, as he can be naturalised. 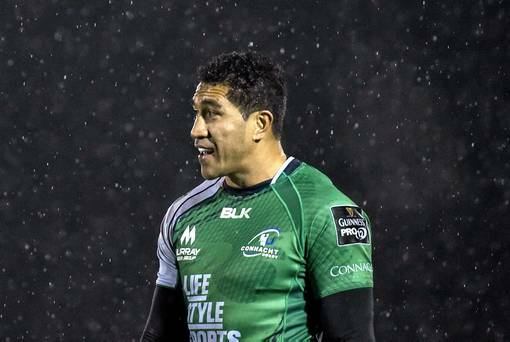 Connacht under Pat Lam have turned a corner, and a tight loss to Edinburgh last weekend aside, their home form has been exemplary. Both Leinster and Munster have been dispatched in serious fashion, with Marmion and Henshaw to the fore in both games, leading the charge and having a visible and important impact in both games. 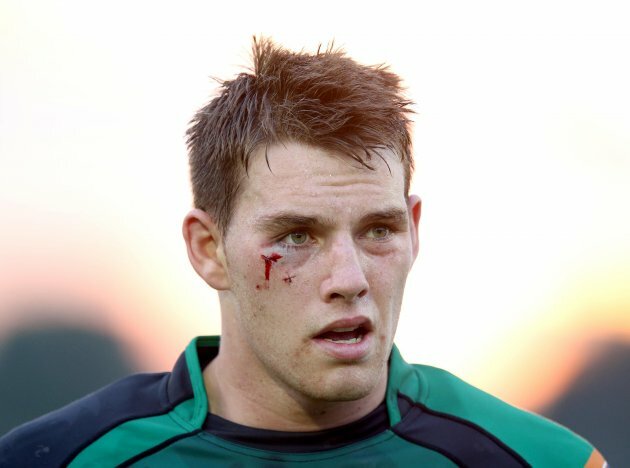 Against Leinster, a serious statement of intent was made with Henshaw’s tackle on Jimmy Gopperth (see below). This fired up the entire team and lifted every single member of the crowd. Marmion scored a fabulous solo try, which was the decisive factor in the victory. In the Munster game, a moment of magic from Henshaw off a chip kick led to him gathering the ball and offloading to Marmion to send him under the sticks for another decisive score. To see these young men taking on this responsibility to be the ones to make the difference is hugely encouraging, and it will only serve to spur their peers on to do the same. As an aside, it is worth noting that with Connacht’s improvement, the murmurs of a move by Henshaw to one of the other provinces to “take his game to the next level” don’t seem to be as cast in stone as they would have been in years gone by. Last season, much was made of the poor form they displayed, but truth be told 7 of their 16 losses were by 7 points or fewer. Their home form left much to be desired though, with their only home wins coming against the usual suspects of Zebre, Treviso Edinburgh and the Dragons. This, coupled with away wins against Zebre and the Dragons, was many things, but impressive wasn’t one of them. This season however, those tight games have been transformed into wins. They have dispatched the Dragons, Leinster, Zebre, the Scarlets and Munster in the Sportsground, and should have beaten both Edinburgh (a 3 point loss) and Cardiff (a draw) at home too. In 2013/14, they lost 9 games by 8 points or more, but this included defeats of 46 points to Ulster, 25 and 17 to the Ospreys, 20 to Treviso and 33 to Edinburgh. This season, they have defeated both Edinburgh and Treviso away, and while they were beaten by 15 points away to the Ospreys and 18 points away to Glasgow, there has been a marked improvement in the consistency stakes with wins being backed up and a competitiveness permeating throughout the majority of Connacht’s games this season. Credit must go to both the backroom team and the young squad for improving on one of the most frustrating aspects of Connacht Rugby over the past few seasons. The usual plucky approach where they’d live with the opposition for 60 minutes and fight bravely has been replaced by a steely determination and a ruthlessness that has not been seen out west too often before. So far anyway, it appears that the IRFU have been fully vindicated in their renewed investment and commitment to Connacht Rugby, and Irish Rugby appears to now be going from strength to strength with the emergence of a fourth province who are no longer the whipping boys and the laughing stock of Irish Rugby. Long may it continue. The West is well and truly alive and kicking! Connacht Abú!